Mum, Dad, George or Charlotte? Who does Prince Louis look like? The most recent look at the beautiful bub has us debating, which of the Cambridges does he look like the most? On Monday, we got our second glimpse of the youngest member of the royal family, Prince Louis. The Duke and Duchess of Cambridge, along with their gorgeous older children Prince George and Princess Charlotte stepped out to The Chapel Royal at St James's Palace in London for the Prince Louis' christening. For the first time, all five Cambridges were photographed together. Prince George and Princess Charlotte in their coordinating blue outfits stayed close to their dad, while Louis slept peacefully in his mother's arms. During the family affair, Kate gave a little insight into her youngest child's personality when she was overhead telling the Arch Bishop of Canterbury, Louis is "very relaxed and peaceful." She added with a laugh, "I hope he stays like this!" Meanwhile, Princess Charlotte showed off her confident nature when she sternly told photographers waiting outside the chapel, "you're not coming". At 11-weeks-old the fifth in line to the throne is simply adorable, but who does he look like? Many have been quick to point out similarities to his dad Prince William, but what about his siblings George and Charlotte? What a beautiful family! The Cambridges arrive for Prince Louis' christening. Here he is! The peaceful prince. Of course the tiny royal will show some resemblance to Prince William, he is his father after all! William was christened at just 6 weeks old in a private ceremony in the Music Room of Buckingham Palace. 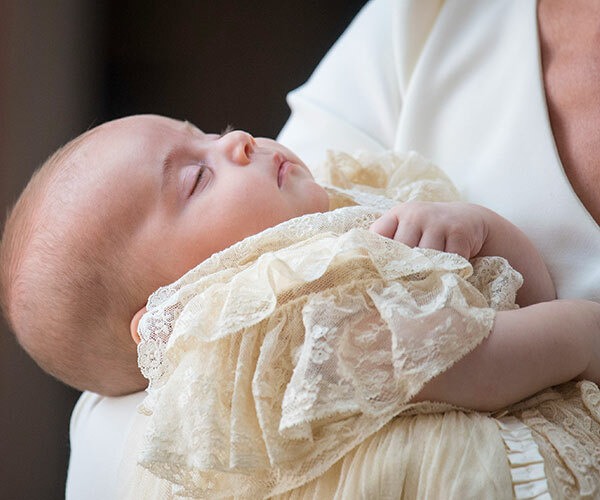 As he sucked on his mother Prince Diana's thumb, the baby prince looked peaceful and serene, just like the sleeping Louis, 36 years later. Prince William at his christening in 1982. Prince William (below) and Prince Louis (above) have the same fair hair and a knack for sleeping through royal events! Prince William with his parents in 1982. We can see where Louis, George and Charlotte get their adorable chubby cheeks from! The Duchess of Cambridge was just too cute as a child. 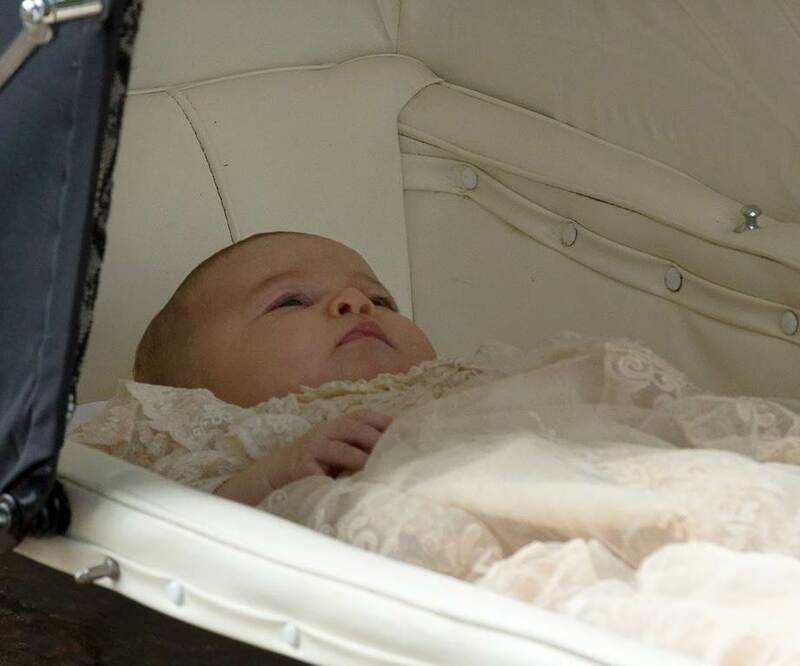 We can see a lot of Charlotte in Kate, but beyond his cheeks, does Louis look Kate? Kate (top right) as a youngster. A young Kate Middleton (left) with her dad and sister Pippa. His older brother, Prince George? With his chubby cheeks and button nose, we think Louis looks almost identical to baby Prince George! The most obvious difference is that George had darker hair and more of it than his little brother currently has. Duchess Catherine cradles Prince George at his christening, October 2013. Twin princes! Prince Louis on left and Prince George on right. Princess Charlotte is quickly paving her path as a true little individual, and in our opinion, the long-lashed princess looks the most unlike either of her siblings. Charlotte does however have the cute, chubby cheeks that is familiar to all the Cambridge children. Swipe across to see if you can spot a resemblance between siblings Louis and Charlotte? Charlotte loves her baby brother!